DAVID J. TAYLOR, sheltering from the blazing sun in the patio of The Garden House Studio at the Holt Festival on the 24th, July, addressed the logistics of George Orwell’s love life. At one point he reminded us that Orwell had once asked a friend if he had ever had a woman in a park? When the reply that came was ‘No!’; Orwell said ‘I have; no where else to go’. 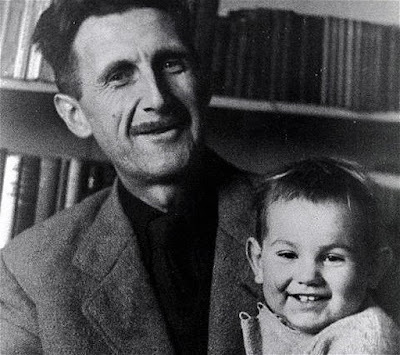 The occasion of this talk in Holt, Norfolk by Orwell’s award winning biographer David Taylor was an exhibition of the hitherto unpublished love letters from George Orwell to Eleanor Jacques in Southwold. The letters involved a correspondence between them which began in mid-1931, and continued until the 13th, January 1936, after he had married Eileen. According to Taylor their sexual relationship concluded around the end of 1932. The title of the Holt event in the pictureses patio of the Garden Studio was 'The Blyth Estuary-A Creative Haven' stems from an area called Blythburgh located on the main A12, about 4 miles west of Southwold in Suffolk. It was a place where Orwell and Eleanor used to go bird nesting, and he was later to refer to these trips together in his letters. Mr. Taylor said 'Orwell's novels reveal a fondness for plein air frolics: they probably had their origin here.' The situation between Eleanor and Orwell was immensely complicated because she was also involved with Dennis Collings, who she later married, and who was a close friend of Orwell. Taylor describes their situation in Southwold as a classic 'Jules et Jim' kind of ménage à trois. Introducing the topic Mr. Taylor pointed to Richard Blair (the adopted son of George Orwell and Eileen Blair) sitting near the back, and members of Eleanor Jacques' family. It's not clear who will have the copyright to the letters, as Richard is Orwell's beneficiary, but the letters are presently in the possession of the Jacques family. Mr. Taylor concluded his talk by justifying his role as a biographer, the search for details like the love letters. He said biographers have no hesitation in grabbing every morsel of information about their subject. After the talk by Mr. Taylor, we chatted with Richard Blair about the event and Tameside Trade Union Council's decision to take out corporate affiliation to THE ORWELL SOCIETY. The Tameside Trades Council had had its eyes wide-open when it took the decision to identify with Orwell and common decency at a time when politics is at a low ebb. A few days before we were in Holt the Daily Mail had reported that students at Manchester University had painted over Rudyard Kipling's venerated poem 'If'. Bernard Crick claims Orwell drew upon Kipling's work when he wrote '1984'. We mentioned the relevance of Orwell to the reports about the attacks on Kipling by the Manchester students as we bought a copy of David Taylor's biography. Plutarch wrote: 'I don't need a friend who changes when I change and who nods when I nod; my shadow does that much better.' Which is of course vintage Orwell, and something these politically- correct students in Manchester could do well to consider. * Plutarch, later named, upon becoming a Roman citizen, Lucius Mestrius Plutarchus, was a Greek biographer and essayist, known primarily for his Parallel Lives and Moralia. He is classified as a Middle Platonist. I think that Kay Ekevall said that she was the girl in the park. She was interviewed for either Orwell Remembered or Remembering Orwell, and was shown in the 5 part documentary in the last week of 1983.